Members of Zeta Tau Alpha (ZTA) gathered Tuesday on the Green to form a “human ribbon” in support of breast cancer awareness. 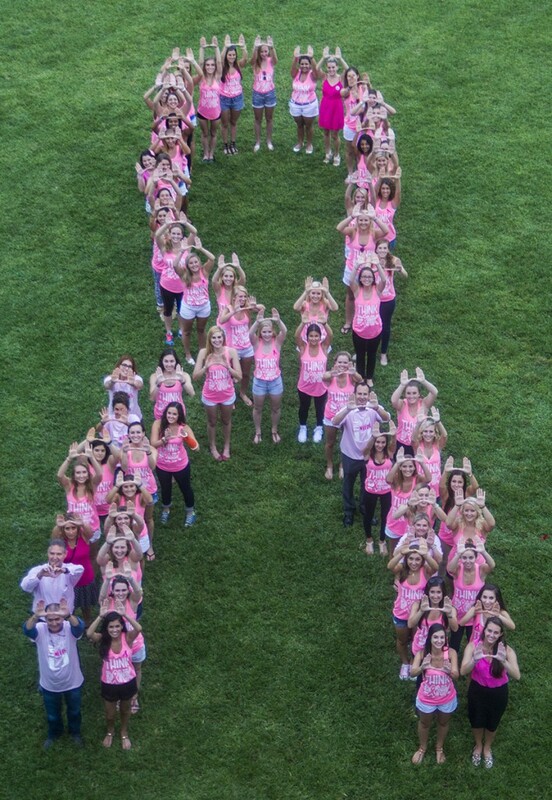 The sisters, clad in pink T-shirts, joined hands with partners from the Sylvester Comprehensive Cancer Center at the Miller School of Medicine and arranged themselves into the shape of the breast cancer awareness symbol for an aerial photo. The photo opportunity was a new addition to the Gamma Alpha Chapter’s annual Think Pink Week, a week-long program that raises awareness and funds for breast cancer treatment. All proceeds benefit the national Zeta Tau Alpha Foundation, which directly funds breast cancer research and education programs. This year, Laura Zebib, the chapter’s philanthropy chair of Think Pink Week, was able to expand the event’s reach with the help of the Sylvester Center. University of Miami employee and cancer survivor Lainey Kieffer brought Zebib into contact with partners at Sylvester, where Kieffer had been treated. On Tuesday, the sisters held a Survivor Celebration that included the human ribbon photo and a “pinked out” cancer awareness fair by the Lakeside Patio. Zeta Tau Alpha has partnered up with professional athletic teams for this event, including the Miami Dolphins and the Miami Heat. The Heat loaned out their 2012 NBA Finals championship trophy to display at the Survivor Celebration and is donating half of the proceeds from ZTA ticket sales to their Oct. 21 game against the Houston Rockets. ZTA invited Kieffer and fellow survivor Paula Holland De Long to speak to the UM community on Tuesday evening about their experiences with breast cancer. Kieffer was diagnosed early at age 28, just days after she celebrated her bridal shower, and her life was turned upside down. She underwent a double mastectomy, reconstructive surgery and months of chemotherapy and radiation. Fortunately, she had plenty of support through her journey and is now cancer-free. Kieffer’s goal today is to help young people realize that breast cancer can affect anyone, regardless of age, and to encourage regular self-checks. According to Zebib, five percent of women diagnosed with breast cancer are diagnosed between the ages of 15 and 25, before they are taught to be on the lookout for breast cancer. As part of Think Pink Week, Sylvester Cancer Center offered breast health and self-examination classes on Wednesday afternoon in the Student Activities Center Executive Council Room. “Something we’re really pushing this year is getting girls who are college-aged to develop healthy habits of breast self-exams,” Zebib said. Sophomore ZTA sister Taylor Hughes agreed. “It’s really important to spread awareness of not only the disease itself but also the importance of early detection,” Hughes said. Other activities include “Breast Man On Campus,” a fundraising pageant for male students that will be at the SAC ballrooms at 7 p.m. on Thursday, as well as a dodgeball tournament on Friday at the Herbert Wellness Center, beginning at 3 p.m.
Delong, who was diagnosed with cancer seventeen years ago, is now a life coach and owner of What’s Next For My Life, a business that helps cancer survivors with the years after the disease. Delong and Kieffer’s stories are just a couple of those of the millions of women who have been affected by breast cancer worldwide.